After a dawn bat survey at the end of May this year, we stopped by Portbury Wharf Nature Reserve for a stroll. The early morning is a wonderful time to watch wildlife with the dawn light bringing out the best in the landscape. 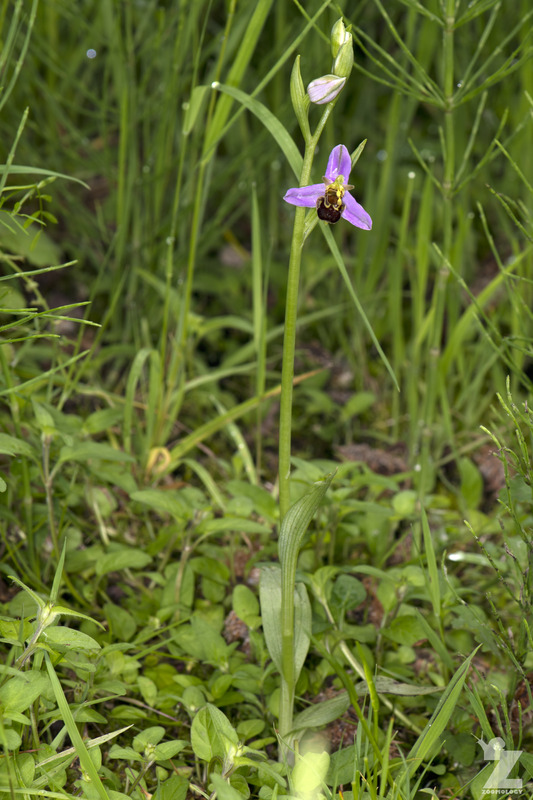 We had gone there to see the birds, but this bee orchid caught our eye. We’ve been hoping to see one for a long time now. We’d even driven out to locations specifically to see them, but had never had any luck. Sometimes what you’re looking for comes when you’re not looking at all! 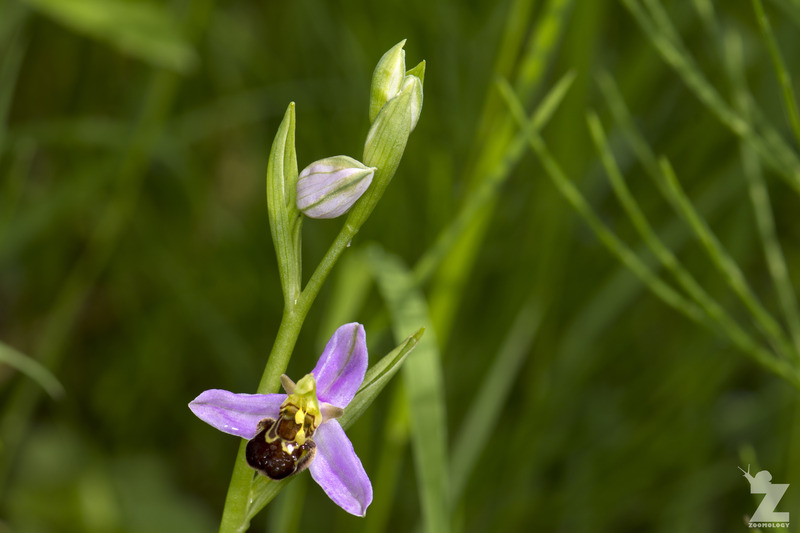 Where does the bee orchid get its name from? The name “Ophrys” comes from the Greek word ophrys, meaning “eyebrow”. The Latin species name “apifera” means “bee-bearing” or “bee-bringing” and refers to the bee-shaped lip of the orchid. The bee orchid (Ophrys apifera) is a hardy flower, growing to a height of 15–50 centimetres (6–20 in). It is variable in the pattern of its colouration, but usually brownish-red with yellow markings. In the Autumn, it develops small rosettes of leaves. They continue to grow slowly during winter. It then blooms during Spring and Summer from mid-April to July producing a spike with one to twelve flowers. It is widespread across central and southern Europe, as well as North Africa and the Middle East. Its range stretches from Portugal, Ireland and Denmark east to Iran and the Caucasus. It is quite common in the Mediterranean region eastwards to the Black Sea, but is less common in its northern range being uncommon or local in Germany and Ireland. In the UK, it has a distinct southeastern preference, being more common in England (where we observed our specimen). What kind of habitat does it live in? It generally grows on semi-dry turf, in grassland, on limestone, calcareous dunes or in open areas in woodland. It prefers calcareous soils, in bright light or dim light. It is a major coloniser of old quarries and roadside verges. Ophrys apifera is the only species of the genus Ophrys which prefers to practice self-pollination. “Self-pollination” is when a flower is pollinated by pollen from the same flower or from another flower on the same plant. The flowers are almost exclusively self-pollinating in the northern ranges of the plant’s distribution, including the UK. In the Mediterranean area, however, the orchid is pollinated by the solitary bee, Eucera. In this case the plant attracts the bee by producing a scent that mimics the scent of the female. The lip of the flower also acts as a decoy which makes the male bee confuse it for a female. Pollen transfer occurs during the ensuing pseudocopulation (when the male attempts to mate with the flower). This is known as reproductive mimicry. To see pseudocopulation in action, see this dated yet very charming video clip from nature cinematographer, Doron Hirshberg, from his 1987 BBC production, “Symphony of Magic: The Wild Orchids in Israel”. It was such a treat for Tom and I to spot these bee orchids. Nature never ceases to surprise us! In fact, we definitely have a soft spot for all orchids and their multitude of forms. We have written about some of our other orchid-adventures previously on our blog. Want to Check Out Another Zoomology Orchid Adventure? Amazing plant, and wonderful photos and videos.